Residents in Catcliffe near Rotherham returned to find their homes devastated on Thursday. Although many of the streets are still deserted some residents milled about watching the clean-up operation or trying to restore order to their own properties. Amanda Monks, 29, spent the morning burying her pet rabbit in the garden after it drowned in its hutch. She and her partner Simon Burke, 29, of Sheffield Lane, said they returned home to salvage their valuables amid rumours of looting in the area. The water level in their front room had reached more than 5ft, but now their entire ground floor is covered in mud. 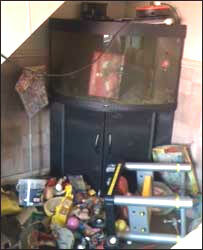 The force of the water was so strong that their fridge-freezer was turned upside down, skirting boards were ripped off the walls and their son Callum's toys ended up inside the fish tank. 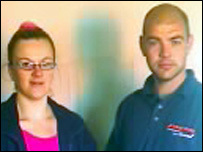 The couple said once the repairs were complete they were considering moving house. Mr Burke said: "I think we've got to cut our losses and get out." It is not the first time the couple's home has been flooded. In 2000, nine days after they moved in, the area was hit by flash floods. Miss Monks said: "They said it was freak weather that caused it last time. How often is this freak weather going to start to come?" The couple said their next door neighbour was currently on safari in Kenya and neither they nor his mother had been able to contact him. His car remained in the driveway covered in a thick layer of mud, but nobody had been inside his house to assess the damage. 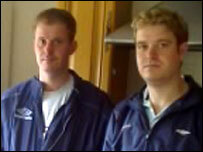 Brothers Russell and Richard Baxter have also returned to Catcliffe. Russell Baxter, 31, said it was the first time he had been home since he returned in a boat to rescue his cats which had got trapped on the first floor of his home. He went to his brother's house and they were told to go by bus to an evacuation centre at Dinnington Comprehensive School, but the pair decided to go to their mother's instead. Russell Baxter said: "We are glad we didn't go (to Dinnington) some people went up there and were almost stuck." The pair ignored police advice and clambered down an embankment to get back to Richard Baxter's house in a bid to salvage valuables as they had heard rumours of looting. Russell Baxter said: "I'm going to go in to get valuable stuff out because of all the pilfering that is going on." His 26-year-old brother added: "You just feel so helpless - you can't do anything." Police patrolling Catcliffe said they had not received any reports of looting, but there would be a presence in the area throughout the day and night. However, Joanne Staniland, 35, of Georgian Mews, said looting had begun on Wednesday. "We stayed in our house for that reason," she said. "We saw gangs of teenagers hanging around and we knew that they didn't live round here. They were knocking on doors and trying the doors to see who was in and who was not. "We were told by the police that they had moved four of five gangs from the area." Meanwhile, in Orgreave Road cars left in driveways are covered in mud and garden plants have been turned brown with a thick layer of silt. Nick Banks, 41, was at his Banks Pottery business with his mother Brenda, 70, in nearby Treeton Lane, opposite the Plough pub. Mr Banks was counting the cost of the floods to his business. The water has swept hundreds of pieces of crockery off shelves and on to the floor, breaking some of the items. 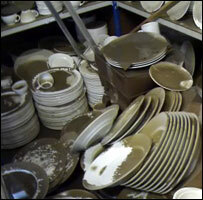 He said many of the tens of thousands of pieces of crockery have been stained brown by the water. "It's the first time I've been able to get in here since Monday night," he said. "You kind of know it's going to be grim but it was tempered by my mum saying it was not as bad as last time (in 2000), because last time all the shelves caved in." Mrs Banks, the former owner of the business, said: "This could all happen again this weekend, they say."